Mathematics inspires much fear in many individuals yet its utility cannot be disregarded. Every aspect of human life is governed by the laws of mathematics. Humanity’s greatest scientific achievements have been the result of the optimal use of mathematics. Indian scientist, Dr K Radhakrishnan, presently chairman of Indian Institutes of Engineering Science and Technology, spoke at the DD Kosambi Festival of Ideas on Mathematics and Space Missions. The necessity of studying mathematics was imposed on the young students in the audience, stressing its usage in daily life as well as professional life. Growing up in a family that had three teachers of mathematics, including his mother, Dr K Radhakrishnan’s first love was mathematics, in school and college. It is, therefore, not surprising he was very enthusiastic in his approach when delivering his speech. Mathematician and historian DD Kosambi’s paper, Precessions of an Elliptical Orbit in 1930, connects him closely to the subject of the talk. He is closely linked with space through mathematics and Dr Homi Bhabha. In 1961, Prime Minister Jawaharlal Nehru decided that it was time for India to become part of the world of space research. It was the emergence of the modern space age with America and the former USSR sending the first artificial satellites into space. This responsibility was entrusted to Dr Homi Bhabha, who was heading the Department of Atomic Energy (DAE). The Indian National Committee for Space Research (INCOSPAR) was set up in 1962 under the chairmanship of Dr Vikram Sarabhai. Thus, the two great scientists’ names were linked to the national space programme for posterity. The Indian Space Research Organisation (ISRO) was established in 1969 and after the Department of Space came into being in 1972, ISRO was brought under its management. Dr Homi Bhabha and Dr Vikram Sarabhai were not only instrumental in the establishment of important space research departments, they also showed the world how science and technology could be used to achieve the space mission and how to gather the most intelligent minds, set before them a complex problem, and derive viable solutions. Aside from the pure joy of working in the field of science, they sought to use this knowledge to benefit humankind. ‘This is what sets the Indian space programme different from the space programmes of other countries,’ said Dr K Radhakrishnan. When the Mars Orbiter Mission (MOM) was successfully launched on 24th September, 2014, it was the mathematicians who were in the forefront. MOM is a feather in India’s cap but it is a small part of what the space programme is all about. The main activity of the space programme is to build satellites for communication, observing Earth, its resources, monitoring climate and weather, disaster management and navigation. These provide vital information to administrators, decision makers and others. All these facilities are provided in a self-reliant manner. MOM has raised national pride because it has achieved what many others could not and that too in the very first attempt. 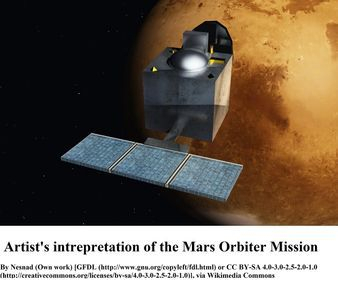 Dr K Radhakrishnan said, ‘It has given us the feeling that impossible things can be done at low costs and in a short period.’ It was in 2011 that the decision was taken to launch an orbiter around Mars. More than 60 satellites have been launched in the last forty years. The first Indian satellite was Aryabhata in 1975, which was completed in a short period of two years. Having learnt from the successes and failures, there has been a progression in the quantity and the complexity of the missions. In the late 70s, the Bhaskara-I could take pictures of one kilometre by one kilometre, but the most recent satellites can take a picture of 0.8 metres by 0.8 metres. India will soon have its equivalent to America’s Global Positioning System with the fourth satellite of the IRNSS (Indian Regional Navigation Satellite System) mission that was launched in March, 2015. The SLV3 (Satellite Launch Vehicle) was the first launch vehicle built in 1980, which was successful. More recently, the famous PSLV (Polar Satellite Launch Vehicle) has been instrumental in launching Chandrayaan-1, Mars Orbiter Mission, IRNSS and others, and is also sought after by international space agencies. It has launched over forty satellites for nineteen countries and holds a record for launching 10 satellites in orbit at one launch in 2008. Dr K Radhakrishnan said, ‘Space agencies from all over want their satellites to be launched by PSLV because of its versatility, because of its reliability. Except for the first flight which was a failure, all the others were a success. This again speaks for the robustness of the design and the quality of each item which the rocket is made, built, assembled and tested.’ In January, 2014, ISRO managed to deal with a major problem related to the GSLV-D5 (Geosynchronous Satellite Launch Vehicle) and its India built cryogenic engine and stage, a very complex technology, and sent GSAT-14 into space with triumph. India now stands in sixth position in the world where space programmes are concerned. In December 2014, an experimental flight of LMV3, a next generation launch vehicle was successful in the crucial atmospheric phase of the flight. Simultaneously, the unmanned crew module (Crew module Atmospheric Re-entry Experiment) that is being developed for the possible future human space flight was tested successfully. The precision and accuracy that is required to launch a particular satellite into a specific orbit, to enable the satellite to carry out its functions, such as taking pictures of the Earth, by maintaining its position in that orbit and pointing to a specific location, can only be achieved by the intellect of mathematicians and physicists. The presence of other satellites creates the need for parking space to be allotted to each satellite in the geostationary orbit. Staying in that parking slot is also a challenge. The impact of the velocity on the rocket traveling at several kilometres per second is tremendous and this needs to be calculated to avoid contingencies. As a rocket re-enters Earth’s atmosphere, kinetic energy is converted into thermal energy, which can disintegrate the object in question. Therefore, insulating materials need to be gauged for their effectiveness. The navigation of the spacecraft to allow it to land in a specific place, at a defined time and predetermining all possible hurdles it could meet with is the task mathematicians are employed to take on. Autonomous rockets have to be able to determine their routes, velocity to be gained and rectification of course in case of deviations. All these factors have to be assessed through simulations. Chandrayaan’s never before travelled distance of 4,00,000 kilometres is seen as a huge milestone, where its position in orbit was achieved by proper estimation of the reduction of velocity. The Mars mission had other issues that needed to be resolved. At its closest, Mars is 55,000,000 kilometres away from the Earth and at its farthest distance, 400,000,000 kilometres. This difference can lead to delay in communication with the ground station. It would take time between the diagnosis of a problem and solving it, hence the spacecraft is equipped with autonomy to see to repairs and changes. The satellite itself is given autonomy and has to constantly monitor its systems. If the primary system develops a problem, the standard system takes over. If a major glitch occurs it has to be in a right position to receive solar energy from the Sun and instructions from the ground station. Predictions had to be made by mathematicians of the behaviour of the spacecraft in case of detrimental weather conditions, such as a cyclone during the launch. The effect of the Sun, the Moon, other planets, and Mars and its satellites on the spacecraft on its long journey also had to be computed. Scientists managed to make it past two big issues: one, of an eclipse that cut off the source of solar energy by providing a back-up battery; and two, as the spacecraft approached Mars, the planet came between the spacecraft and its communication link to Earth. Before the launch on 24th September all these eventualities were foreseen and plans were made to set right any untoward happening. ‘What it has shown us is that, yes, if you have a dream, you go ahead with grit and determination and you realise it as a team, getting everyone together. Don’t get swayed by somebody’s comments, but take all the care when something eventually happens with clear focus. Then you can do it,’ said Dr K Radhkrishnan. The Indian mission to Mars has been compared with the US mission, Maven, which took 11 years from conception to fruition and was far more expensive ($671 million). The Indian mission took only 4 years and cost $74 million.